Los Angeles is known around the country for its high property prices. Nowhere is this tendency more evident than when looking at the areas hosting the most expensive homes for sale in Los Angeles: Bel Air & Holmby Hills. The average Bel Air home goes for a balance-busting $7.7 million, and properties can be as valuable as $500 million. It’s no wonder that with these concentrations of homes for the super-rich, most of them are located in gated communities for security and privacy. What Is The Average Price of a Home in Los Angeles? For a sense of perspective, it’s important to understand the relative value of the properties in Holmby Hills and Bel Air compared to the average property in Los Angeles. The median value of a home in Los Angeles is $570,500. The median amount spent on a home purchase between July and October 2018 was $802,750. The staggering gulf in value between typical LA homes and homes in LA’s most exclusive neighborhoods may initially be hard to understand, but there are compelling reasons for such a disparity. Where Are The Most Expensive Condos in Los Angeles? For those who prize high-rise views and a strong sense of city living more than seclusion, Los Angeles is more than ready to satisfy your tastes. However, the most outstanding luxury condos are not in Bel Air or Holmby Hills. They’re in the upmarket urban playgrounds of West Hollywood, Santa Monica, Century City, and Westwood. One of these ultra-deluxe condos could set you back as much as $49 million, for the most expensive, and the 25 most expensive condos in the city are all over $6.4 million. 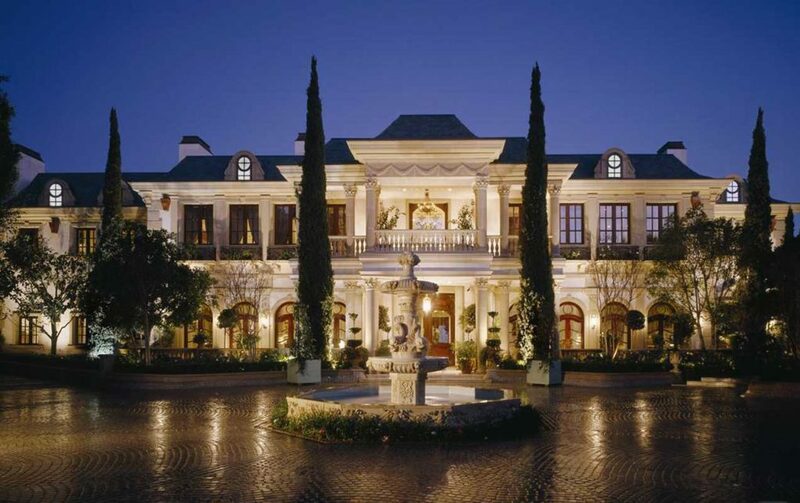 There are highly expensive neighborhoods in many areas of Los Angeles, beyond Holmby Hills and Bel Air. Malibu, with its fantastic sunsets and ocean access, is known for its exclusive property prices, especially in the Carbon Mesa and Colony neighborhoods. Beverly Hills also stands out as an area for the ultra-rich, with Trousdale, the Beverly Hills Flats, and the Beverly Hills Gateway all being bywords for luxury living. Why do Holmby Hills and Bel Air in particular have such a remarkable amount of value attached to them? It being Los Angeles, there is a certain amount of cachet associated with living among the creme de la creme of the entertainment industry. At various times, Humphrey Bogart, Walt Disney, Michael Jackson, Barbra Streisand, Beyoncé, Jay-Z, Alfred Hitchcock, and more have made their homes in these parts of the city. Holmby Hills and Bel Air are part of the ‘Platinum Triangle’, a quarter of Los Angeles which also includes the world-renowned neighborhood of Beverly Hills. These neighborhoods share access to some of the country’s finest dining, shopping, and recreation, and are within easy reach of both Santa Monica’s famous Promenade and Pier and West Hollywood’s Sunset Strip, for additional shopping opportunities, family entertainment, and nightlife. Other aspects that add to the status of these coveted neighborhoods are their natural beauty, nestled as they are in the picturesque foothills of the Santa Monica Mountains. They also grant easy access to the coastline. Compared with other parts of the county, Bel Air weather is very agreeable. It enjoys an extremely mild and comfortable climate, the shade offered by the ample vegetation, mountainsides, and proximity to the ocean keeping temperatures down even in the height of summer, with highs barely cresting 80 degrees. This combined with the year-round sunshine make the climate highly appealing compared to neighborhoods on the balmy East Side. Another lure are the excellent schools in the area, including the Harvard-Westlake middle school and Marymount High School. Additionally, Bel Air and Holmby Hills share a proximity to institutes of higher learning: UCLA and the American Jewish University. In the country’s most populated county, Holmby Hills and Bel Air are among the least densely populated neighborhoods, with barely 1,200 people per square mile, compared to Koreatown (42.6 thousand per square mile) or East Hollywood (31.1 thousand per square mile). That seclusion and comparative serenity can make a great deal of difference in a city as congested and frenetic as Los Angeles. In spite of their relative lack of traffic, both neighborhoods benefit greatly from access to one of the county’s main arteries, the I-405 highway, which grants easy access to LAX and the Valley, as well as the rest of the city via its intersections with other highways. Holmby Hills and Bel Air are perfectly located for a combination of accessibility and privacy. In addition, the proliferation of plant life and relative lack of traffic does a great deal for the air quality in the area, improving the health and quality of life of those who call Holmby Hills or Bel Air home. Bel Air and Holmby Hills’ lack of population density is in many ways attributable to the generous lots that the neighborhoods give their tenants. This in combination with the privacy hedges that proliferate between homes means that there is less of a need to adhere to a neighborhood aesthetic. Whether your tastes in homes lean toward single-level ranches, two-storey structures, or sprawling mansions, there is a property to suit your tastes in Bel Air and Holmby Hills. So what does all that cash get you, besides a home in one of the most exclusive zip codes in the country? Well, swimming pools come almost as standard. Even a modest Bel Air home is more likely than not to have a private pool to unwind in after a long day, or to enjoy at the weekend. What might surprise you is the number of homes that come with extras. Around one in six Bel Air properties on the market offer their own private tennis court facilities. Do you enjoy getting in a quick set on your days off? Bel Air might be the place to settle. You certainly won’t be short on partners for doubles. Of course, with all the land the average lot has to spare, it’s unsurprising that many properties have had extensive landscaping performed. Many homes come with water features such as ponds, designed to augment the sense of serenity you might experience away from the hustle and bustle of the city at large. For help in finding the most expensive homes for sale in Los Angeles, visit our custom MLS listing page with available properties in Bel Air Enclave, Holmby Hills and Beverly Hills. Current listings include ultra-exclusive listings in Bel Air Enclave along with a home built by Aaron & Candy Spelling on Mapleton Drive and the magnificient estate Maison Du Soleil in Holmby Hills. In our property overview page, you’ll find the location address, pricing and home features like number of bedrooms, baths and square footage. Each listing also features a photo gallery with pictures of the home’s interior and exterior. Sheri provides expert guidance in finding or selling your estate property. Call today at +1 (323) 332-1985.